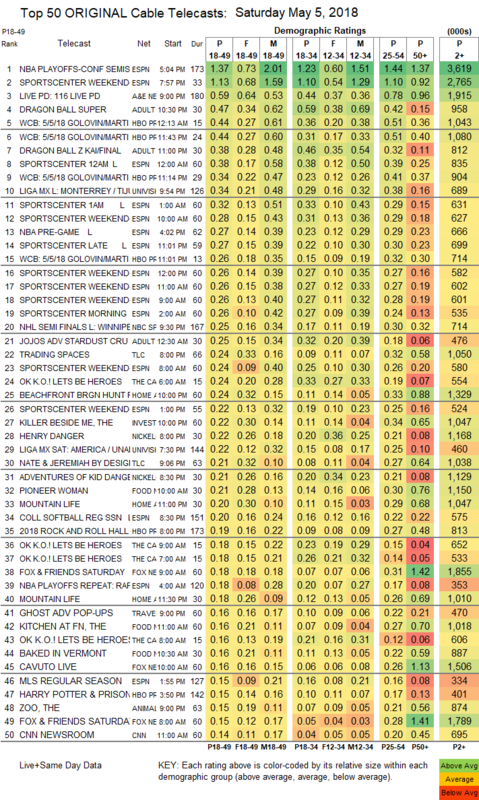 NETWORK FINALS: ABC’s NBA PLAYOFFS game adjusted up 0.3 to 2.2, and NBC’s SNL rerun lost 0.2 in final numbers. CABLE HIGHLIGHTS: ESPN’s NBA PLAYOFFS game was at 1.37. 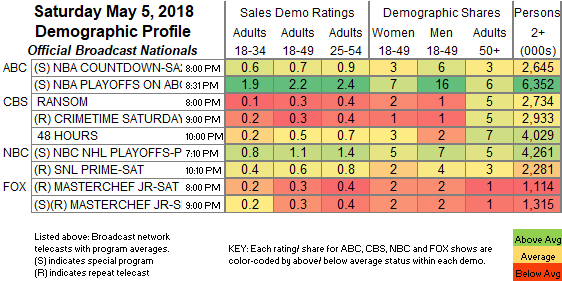 A&E’s LIVE PD slipped 0.04 to 0.59. The Adult Swim late-night line-up performed as follows: DRAGON BALL at 0.47/0.38 compared to last week’s 0.43/0.34, newcomer MY HERO ACADEMIA at 0.35/718K, FOOLY COOLY up 0.02 to 0.29/577K, JOJO’S BIZARRE ADVENTURE up 0.03 to 0.25, HUNTER X HUNTER up 0.01 to 0.22/444K, BLACK CLOVER down 0.01 to 0.19, NARUTO down 0.01 to 0.18/372K, SPACE DANDY down 0.02 to 0.15/320K, COWBOY BEBOP down 0.01 to 0.16/323K, and GHOST IN THE SHELL down 0.01 to 0.14/296K. HBO’s BOXING was as usual rated in segments, those being 0.44/0.44/0.34/0.26, and the ROCK & ROLL HALL OF FAME INDUCTION special was at 0.19. Univision’s LIGA matches were at 0.34/0.22. NBC Sports Net’s NHL PLAYOFFS game was at 0.25. On TLC, TRADING SPACES dropped 0.05 to 0.24, and NATE & JEREMIAH BY DESIGN was up 0.03 to 0.21. ID’s THE KILLER BESIDE ME fell 0.05 to 0.22. On Food Network, PIONEER WOMAN shed 0.02 to 0.21, and KITCHEN AT FN was down 0.08 to 0.16. OWN’s BOOK OF JOHN GRAY ticked up to 0.08.